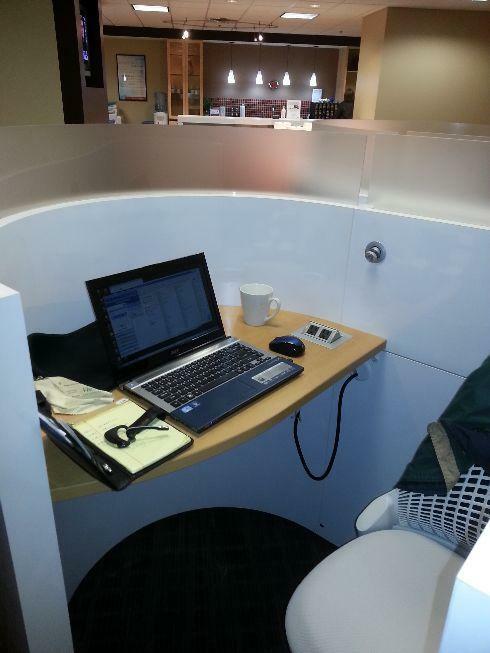 Regus – My Office Away From The Office! HomeWorking SmartRegus – My Office Away From The Office! I work for a small company employing 60 in North America. I’m 1 of 2 product specialists who develops solutions for our end users. My job role includes traveling to meet our end users and clients for both sales and training. Thankfully, I have access to 3000 office locations in 900 cities worldwide. Not bad for a small company! But this is thanks to my Regis Businessworld membership. Before my Regis membership, when I needed a quiet place to do office work while traveling, I would find a coffee shop such as Starbucks. Anyone who visits Starbucks on a regular basis will know, they are far from ideal for making telephone calls to prospective clients. Also, if I needed to meet with a client away from their facility, I would rent a conference room at a nearby hotel. But using a hotel conference room didn’t project the level of professionalism I wanted. I needed someplace quiet, similar to that of an airline lounge. A colleague suggested looking into a Regis Businessworld membership, so I gave them a try. I was impressed and signed up. My Regis membership gives me access to office space and facilities in most major cities. If I need to catch up on emails, telephone calls or write a major proposal, then Regis provides me with a quiet workspace that’s conducive to performing these tasks. I have access to administrative staff, photocopying machines, fax machines, document scanners and the all-important coffee pot. Some of their facilities also offer cubicles called Thinkpods that provide a little more privacy. For an additional fee, I can rent a conference room. I’ve done this many times where I’ve had to hold meetings with clients, conduct product demonstrations or customer training. The conference rooms include either a large screen TV or projection system for presentations, a whiteboard, a speakerphone and a video conferencing system. One very nice advantage with Regis is the low profile the company and their staff keep. Regus displays very few signs advertising the building and office space as belonging to them. They go one step further by having their office staff represents themselves as being members of my company when I have clients come to visit adding more professionalism making a positive experience for my clients. If I need extra privacy for say conducting interviews, or to work on equipment or repair equipment; I can rent a day office. A day office is a fully furnished office with telephone and a door I can close. They are designed to accommodate two people and are rented out by the hour. Using a day office provides ultimate privacy for discussing confidential issues either in person or over the phone. And I still have access to all the administrative support Regis provides. A quiet place to work and make telephone calls. Access to administrative support staff. Access to photocopying, fax machines and scanners. 10% discounts on meeting rooms, day offices and video conferencing facilities. Walk-in any time to use the business lounge and facilities on demand. The $59 monthly fee may seem a little steep at first glance. But in reality, this is on par with most airline lounge access fees. For me, it’s a small price to pay for saying that I have access to a little over 3000 office facilities worldwide where I can work productively, efficiently and smart.